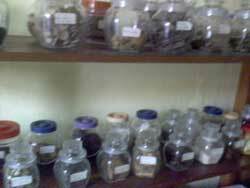 Ubud Healing Center exist since 1991 it is supported by the very talented and experienced acupuncturist, he is Mr. Akuh Suryana who has been famous to several countries especially he well known in Europe, America and Autralia. Ubud Healing Center open now acupuncture training for three months, which will be held on November 15th 2009 guided by Mr. Akuh Suryana. Moxibustion is a part of traditional Chinese medicine method conjunction with acupuncture that is called Cen Ciu or acupuncture moxibustion. Normaly moxibustion is used which in practice does not use needles, but rather uses a kind of cigars made from leaves ai (Mugwort) or commonly called a moxa, and the cigar burned with fire and then brought near to above the acupuncture point purpose stimulate acupuncture points by heating, usually in combination with needle or without needles. Treatment with moxibustion is used on patients with disease cold type (Yin) or stagnant conditions such as arthritis, rheumatic diseases, cramp in muscles, back ache, pain and stiffness in the shoulders and neck, joint pain, diarrhea, cold type of asthma, common cold, eczema, etc. Moxibustion is often combine with acupuncture therapy for various types of diseases. Treatment brings warmth and helps strengthen the blood circulation. Moxibustion treatment does not cause skin burns because the aim is simply to stimulate the heating of acupuncture points about 1 - 2 cm above the skin surface.